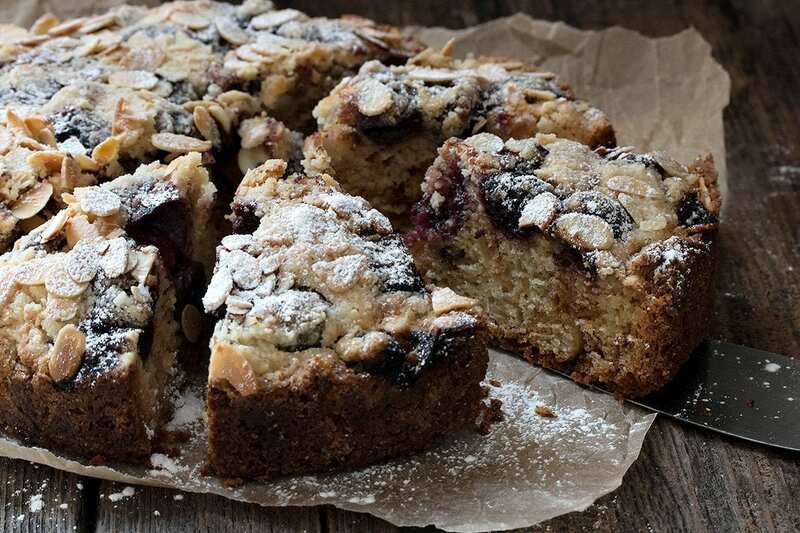 This delicious and moist Cherry Almond Coffee Cake starts with frozen or fresh sweet cherries and is lightly sweet, so it’s perfect to enjoy any time of day! 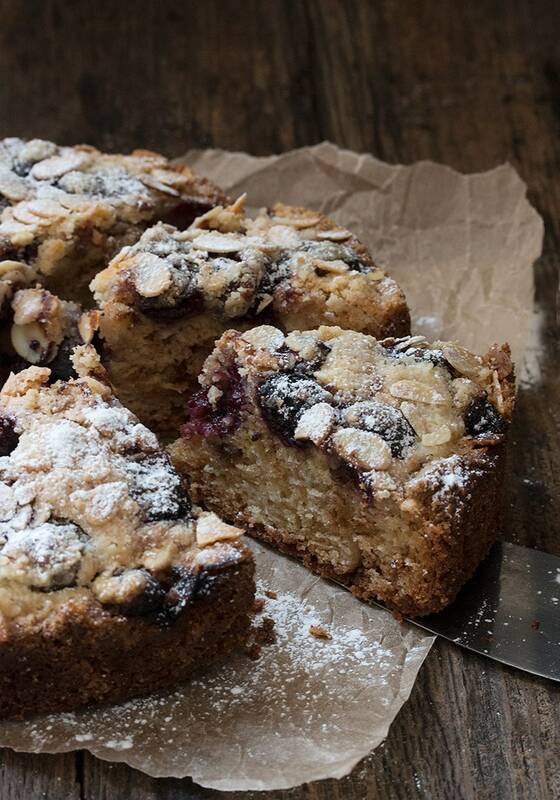 This Cherry Almond Coffee Cake is one I turn to often, when I’m feeling the need for a coffee cake. 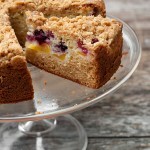 It’s lightly sweet, perfectly flavoured with almonds and topped with lots of juicy cherries. 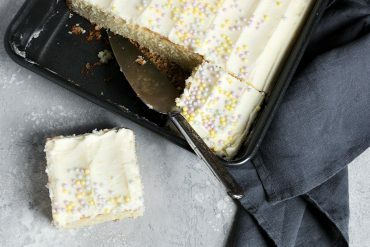 Enjoy this cake for breakfast, for an afternoon treat or warm it for a dessert cake, topped with a bit of vanilla ice cream. True confession … I’m not a fan of almond extract. I know there are people who just love it (and put it in everything :), but I’m not one of those people. I find it over-powering and artificial tasting. So needless to say, I don’t bake with it. In fact, I don’t even have it in my house. All that said, if you are one of those lovers I spoke of, feel free to use some in this cake in place of the vanilla. Speaking of almonds, I always seem to have ground almonds around, since I like to bake macarons. If you don’t have some and you don’t want to buy some (they can be expensive), you can grind up your own almonds of any shape in a food processor to make the 1/4 cup. 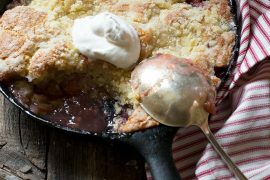 As noted in the recipe, don’t be skimpy with the cherries on top. You should pretty much cover the top with cherries, with just a bit of the batter showing when you’re done. Frozen sweet cherries are available year round, so you can enjoy this cake any time of year. If it’s sweet cherry season though, freel free to replace with pitted fresh sweet cherries in this one. This cake takes a while to cook and the timing may vary in your oven, so be sure to check regularly after the one hour mark, test with a skewer in the centre of the cake and then bake it as long as it needs (even if it’s longer than the time indicated in the recipe). 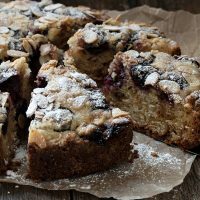 A moist and delicious coffee cake, flavoured with ground almonds and topped with sliced almonds and lots of big, juicy sweet cherries. 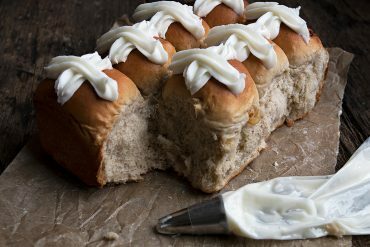 Prepare 8-inch springform pan by spraying the sides with baking spray and lining the bottom with a round of parchment paper. Place onto a baking sheet and set aside. In a large bowl, whisk together the flour, ground almonds and sugar. Using a pastry cutter or two knives, cut in butter until crumbly. Remove 3/4 cup of the crumb mixture to a small bowl and place the bowl in the freezer while you make the rest of the cake. Add the baking powder, baking soda and salt to the remaining crumb mixture. In a small bowl, stir together the egg, sour cream and vanilla and add to the dry mix, stirring until blended. Spoon mixture into the prepared springform pan and using the back of a spoon press to the edges and even the top somewhat (mixture will be thick and dry/crumbly). Spread cherries evenly over the top (Be generous. The cherries should almost completely cover the batter, with just a bit of space in between). Sprinkle cherries with 1 Tbsp sugar. Spoon the reserved crumb mixture from the freezer over-top, then scatter the top with sliced almonds. Bake cake (on top of baking sheet) at 350°F for 70-80 minutes or until center is set (when tested with a skewer) and top is lightly golden in spots and deep golden around the edges. Cool on a wire rack in pan for 5 minutes, then run a knife around the edge of the pan and remove the side ring. Continue to cook on rack until cooled. 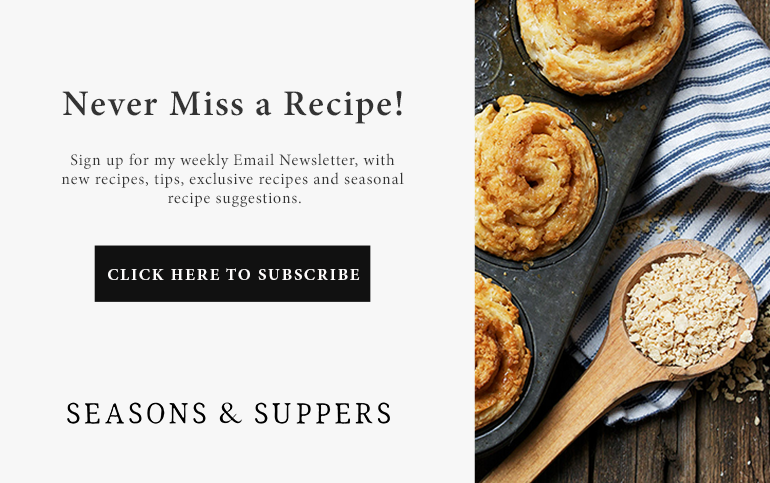 Be sure to check out the Cook's Notes in the blog post, for more tips and tricks for this recipe! 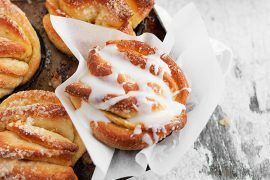 This delicious coffee cake starts with a bit of yeast, but there is absolutely no kneading involved. And it's one-pan easy. A delicious combination of peach and berries. Start with fresh or frozen fruit. 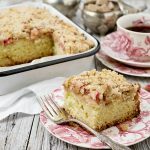 Perfect for your fresh or frozen rhubarb, this coffee cake has a great crumb topping! I made this cake last week-end and it was such a hit, that hubby has already requested this as his birthday cake for next October!!! Just wanted to know if it freezes well? Really excellent cake! 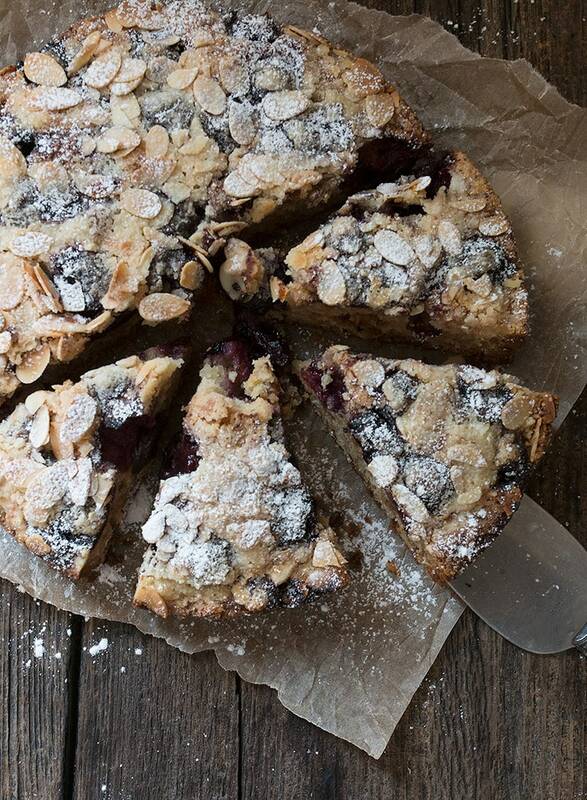 We freeze bing cherries in the summer and make this cake all fall and winter. Sometimes the kids like a glade drizzled on top with icing sugar and some almond extract. There is no coffee mentioned in the ingredient list? Hi Nicola, generally coffee cake doesn’t have coffee in it, but rather is intended to be eaten “with a coffee”. At least that’s the expectation here. I have question about “ground almonds”. Can I using Almond Flour instead ? 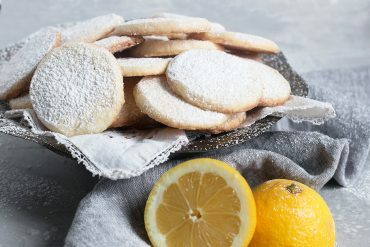 Recently I just got Almond Flour, I ‘m wondering that I can using with this recipe. 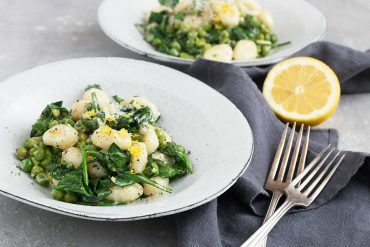 Sometimes ground almonds are called almond flour, but if the flour you have is very fine and powdery (a true “flour”), I would suggest using ground almonds, instead, for the texture. Thank you so much ! I would do that you recommending me ! I am a huge fan of coffee cake (who isn’t?! ), and the cherry almond combination sounds divine! Sharing! Nothing beats a slice of coffee cake with my morning dose of caffeine! Looks awesome Jennifer! Every day should be coffee cake day if you ask me!! I mean, I’ll take any excuse to eat this beauty on repeat!!! 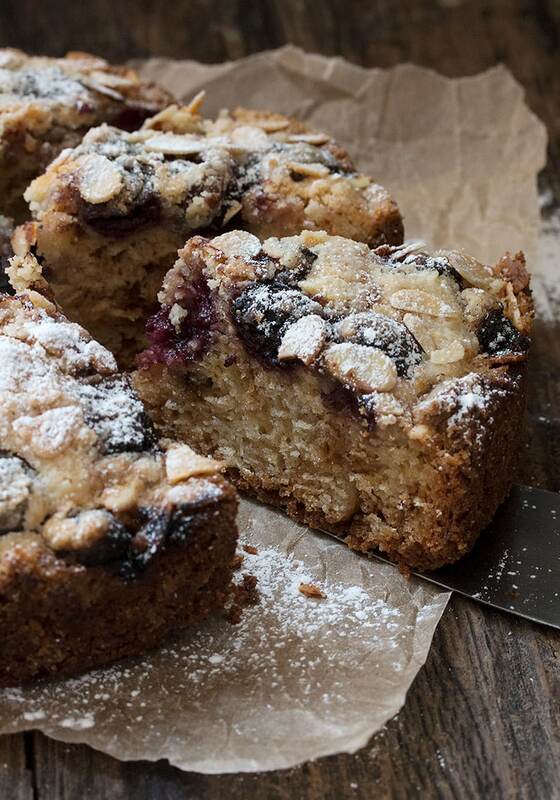 This coffee cake looks absolutely delicious, Jennifer!!! I am loving that almond and cherry combo! SO yum!! Cheers! 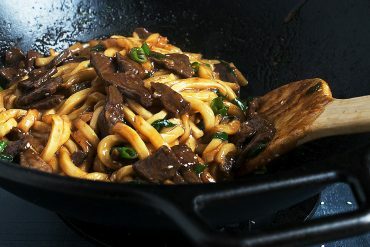 This looks crazy delicious Jennifer – pinning for my next brunch! 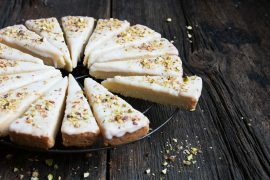 I am a fan of almond extract – just love the stuff! I bet it would be perfect in this cake with cherries :) This is my kind of cake for sure and I’ll have to add it to my list of things to make when I have company again. So pretty and no doubt delicious. Love the almonds on top! It would be nice in this cake Tricia (if you love it :). Thanks! 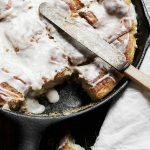 I’m a coffee cake girl, and this is right up my street ~ sharing and pinning!